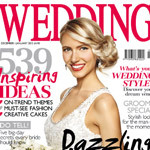 The beautiful couple that is Sarah & Matthew have a wedding tale made of every little girl’s dreams! I’m not sure where their love affair begun, but it was proclaimed in the magical city of Style and Amor, Paris! A trip to Paris, France with her handsome hero concluded with a proposal at the Eiffel tower, how romantic and straight from a fairy tale! 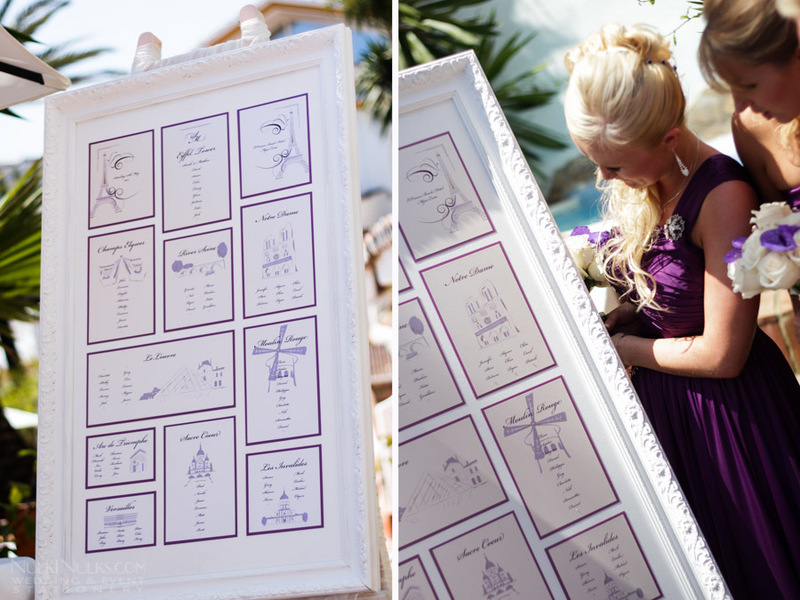 Now that Paris holds their hearts at this milestone in life, they wanted to keep it with them throughout their wedding and what better way, but through their stationery! Our journey started over a year before the wedding date. With family and friends living in different parts of the world, Sarah wanted to announce and ask her girlfriends well in advance to be with her on the big day. My first task was to design and create Bridesmaids Invitations for her close friends. Sarah had seen some of my bespoke 3D cut-out cards and liked the idea of something along these lines. 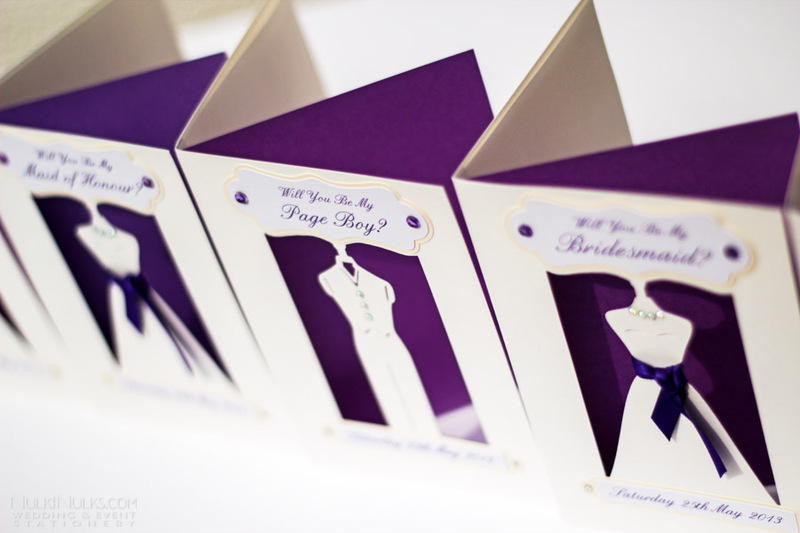 I’m pleased to say she was happy with her cards and we also had the chance to introduce her main wedding colour – purple. Next our attentions turned to the ‘Save the Date’. This is where they really wanted to introduce the Paris element along with the chosen colour palette. Again Sarah had found a design I had created some time ago, it’s no longer featured on my website, but it was one that she liked, so it made a happy comeback with a twist! 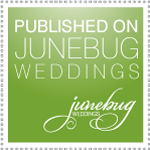 Save the Dates were paperless and went out well in advance to give everyone time to book flights and holidays. Once their wedding plans were a little more finely tuned, we set to work on the invitations which followed the same scheme. 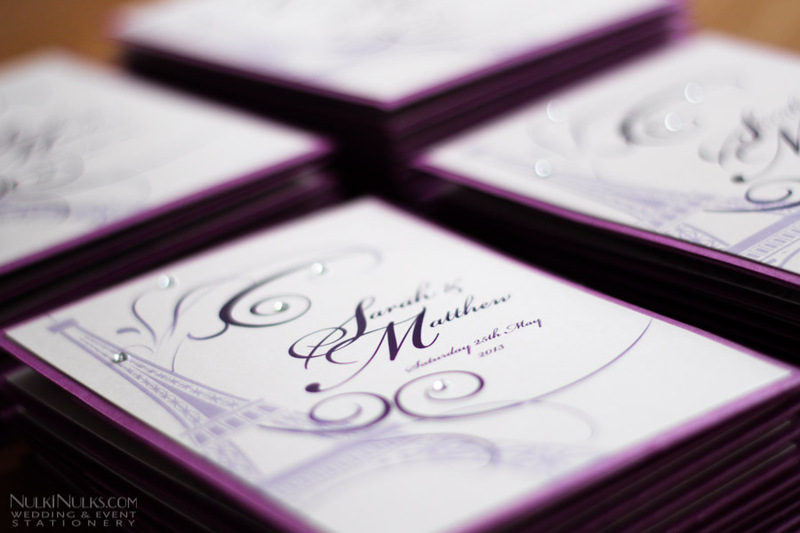 A purple pearlescent pocket was created with a title card adhered to the front and a smart pocket to house the invitation cards. 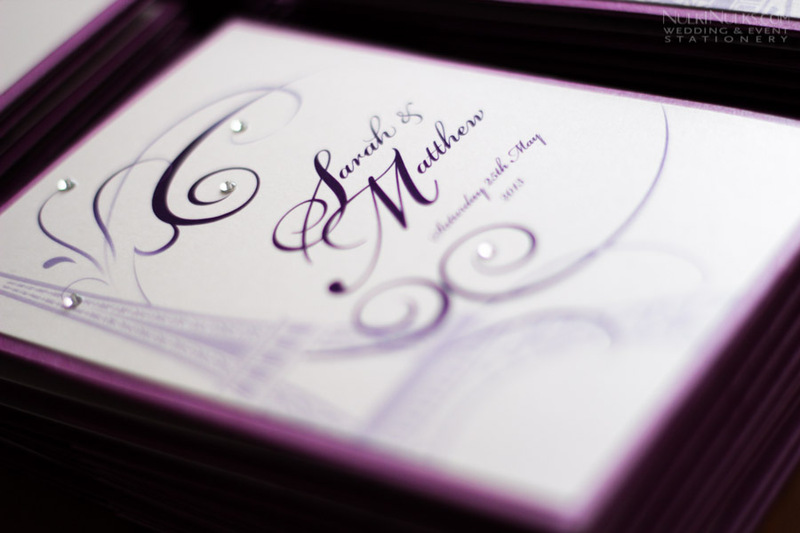 Invitation cards consisted of invitation wording along with a guest information sheet, all printed on an ivory pearlescent card stock and finished with diamante detailing. Our Paris themed wedding didn’t end there, we had one final phase, the ‘Wedding Day’ stationery. This consisted of a Table Plan and Names of famous Parisian Monuments, who says weddings can’t be educational as well?! 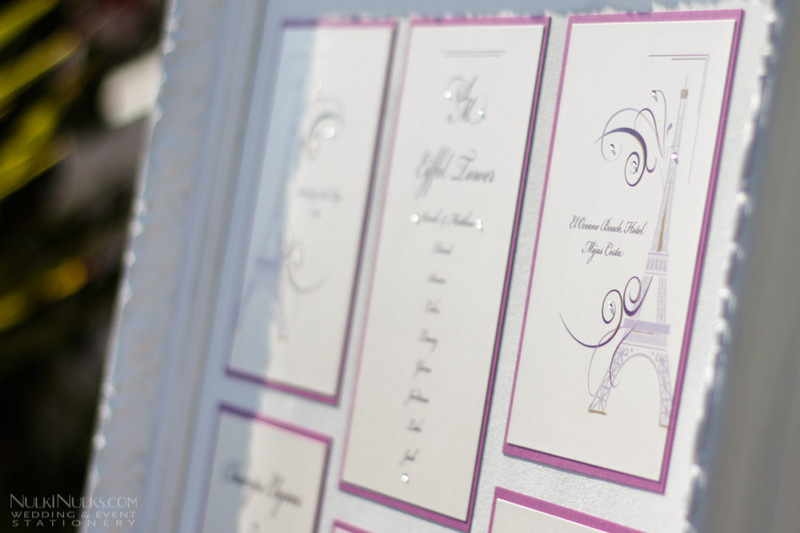 Each table plan card had individually designed images of each monument which were then layered on contrasting card and hand finished with a touch of metallic paint and diamante. 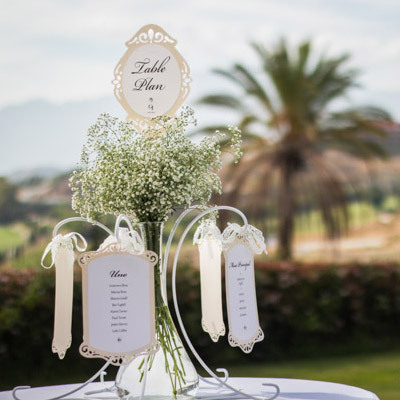 Table Plan Cards were then displayed on a large frame and easel for the guests to view throughout cocktails. 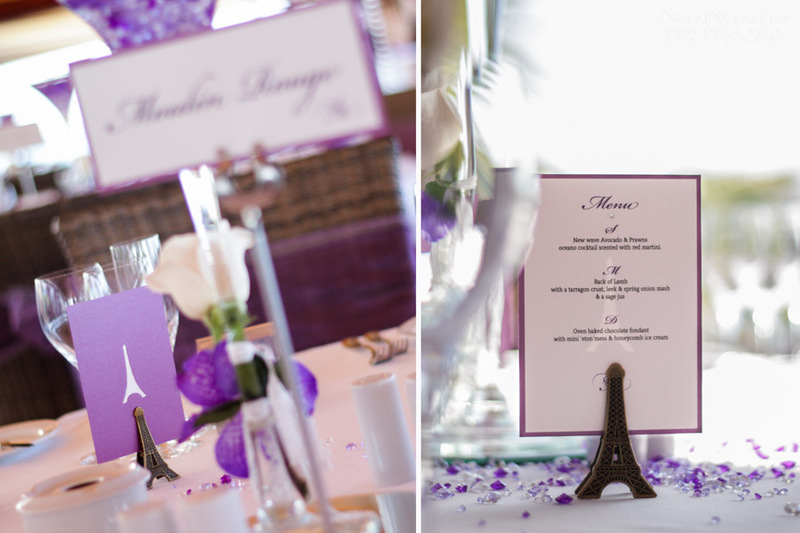 Napkins were decorated with ribbon and custom shaped Eiffel Tower place cards, mini menus, guest book message and sweet cart signage completed the wedding and love affair with Paris. I’m interest on you invitation. How would i get prices? 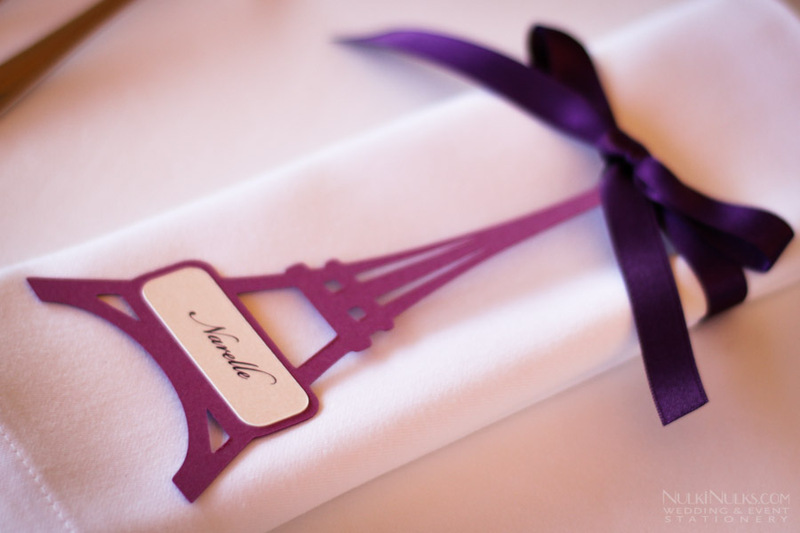 Hi I am having an paris theme wedding and I really want to incorporate the Eiffel tower cut outs. Who would I be able to order them? Is this theme still available to order as I cannot find it in your collection link from the home page? I love the font used in the invitations. Would you mind sharing want for you used? Hi this set is beautiful! 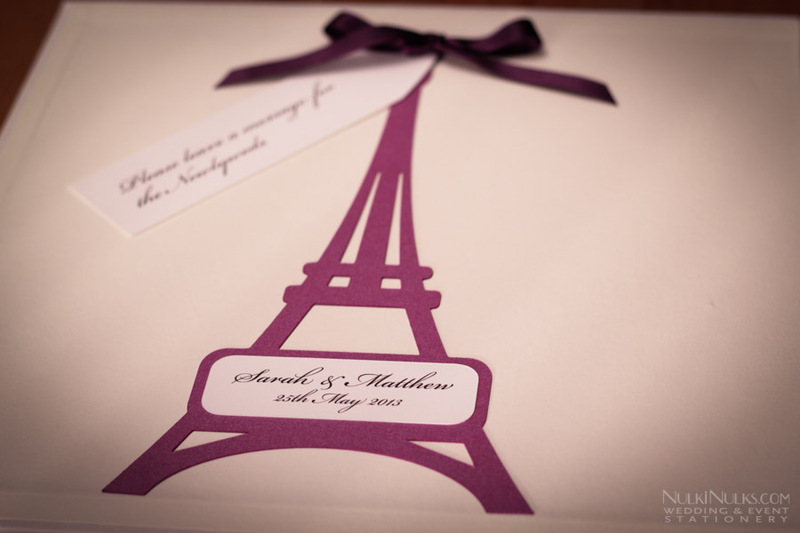 Can the Paris themed invitations folders and accessories be in baby pink versus purple? Hello! Thank you for your comment and yes, it could be created with a different accent colour as all of our stationery is made to order. 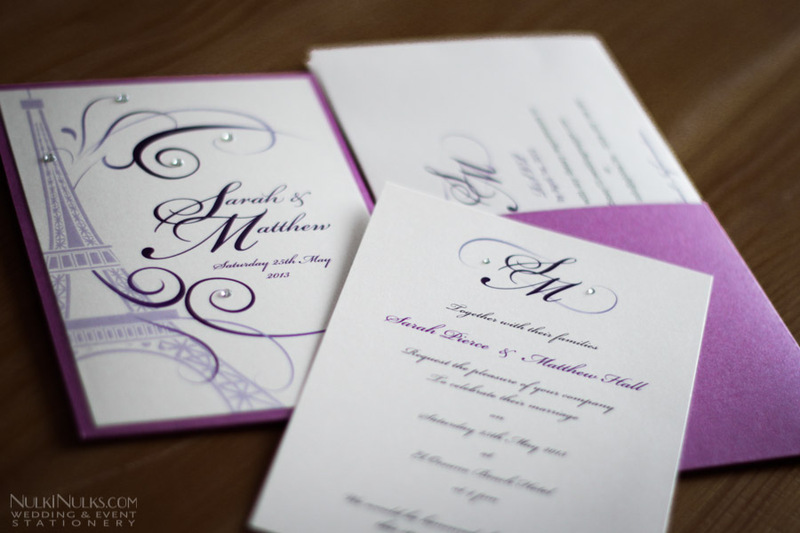 Yes, the invitation can be made with a different colour palette. 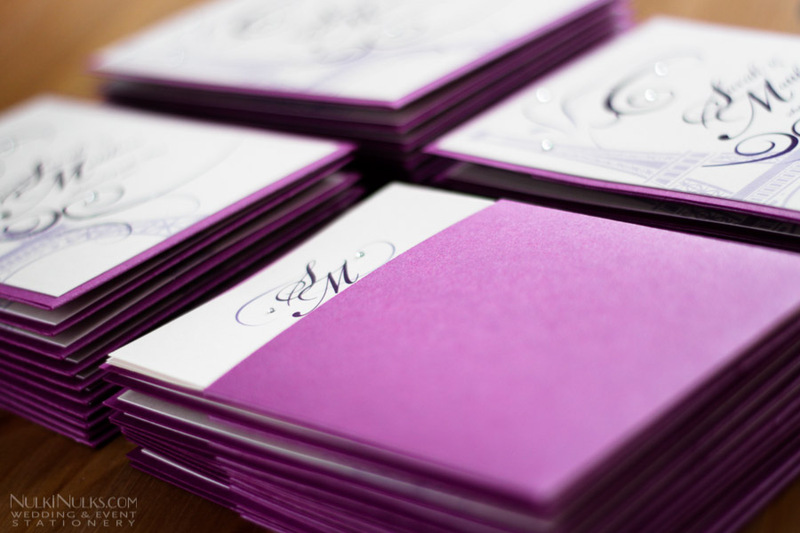 All of our stationery is made to order with your colour and wording requirements. Drop us a line at [email protected] if we can help you further. 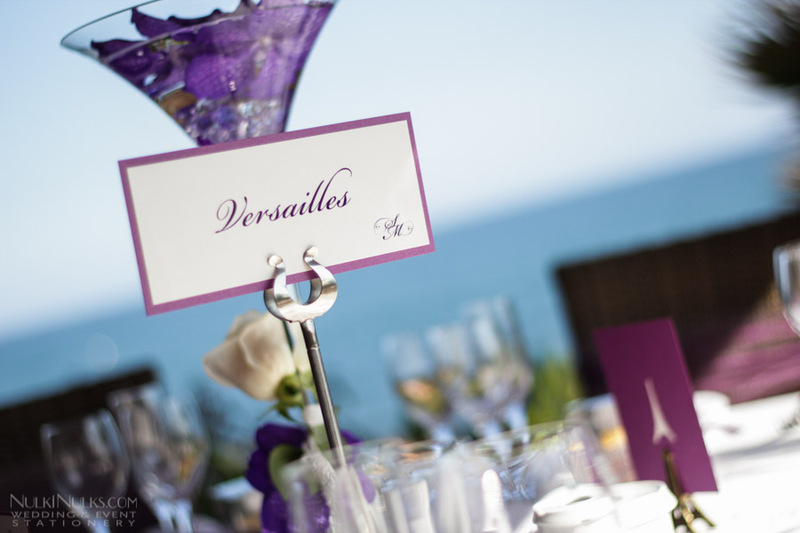 I’m interested in the table plan with the monuments in Paris. Could you reproduce those but in a different color? Yes, these could be reproduced in a different colour.